So...I consider myself a person of normal intelligence. I've even excelled at some things throughout my life. But tonight I'm stumped. I've been spending my after-work hours stuffing our lives into storage boxes. Since we're renting the house out while we're gone, everything not going with us to India has to be stored off-site. Which means it has to be transported in a somewhat organized manner. We chose to buy a million and one plastic tubs of the same size, so they will be easily stacked. We've made several trips to Jason's parents (where we are storing the majority - sorry about the huge orange box in your yard Gena!) but there's still a lot to be done. I decided to attack the living room this week. I managed just fine with the DVD's, random decorations, and most of the contents of the hardware drawer. A huge pile of cords and cables. Some of them are easy...the circles are cable, the tiny flat ones are phone cords, and I have a pretty good selection of USB component cables. But then I run in to the regular-sized USB. Or at least I think they are USB. I have a feeling HDMI cables are maybe mixed in this bunch, and considering how expensive they are, it's probably something I want to take with us. For any of you technology savy people out there - pop quiz! 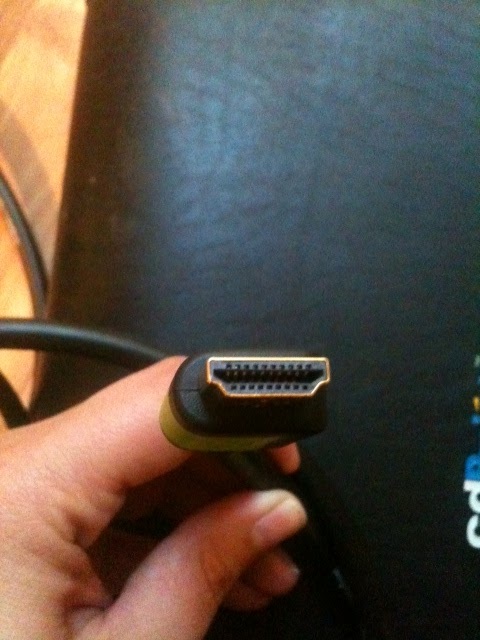 HDMI or USB? 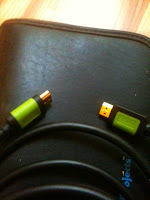 The top photo is hdmi, can't tell on the lower one.